Any American born before 1995 is likely to have vivid memories of September 11, 2001. The tragedy of that day is only surpassed by the indomitable spirit of those who pause each year to remember. We remember the innocent victims. 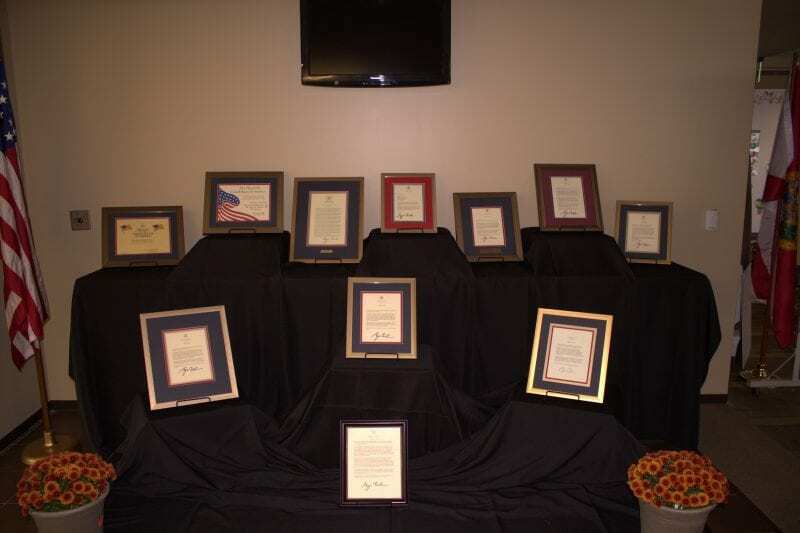 Pay honor to the heroes who ran into danger to help others flee from it. We especially bring to mind those heroes who lost their lives responding to the call to serve. After the events of that day so many people asked what can we do? How can we help? There were 36,000 units of blood donated in New York City in the immediate aftermath of the attacks. 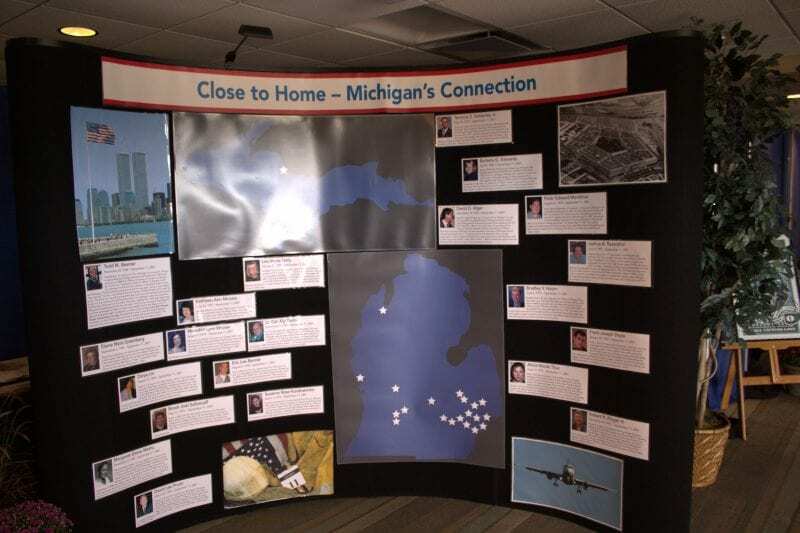 Locally Michigan International Speedway hosted their first Spirit of America Blood Drive in 2002. 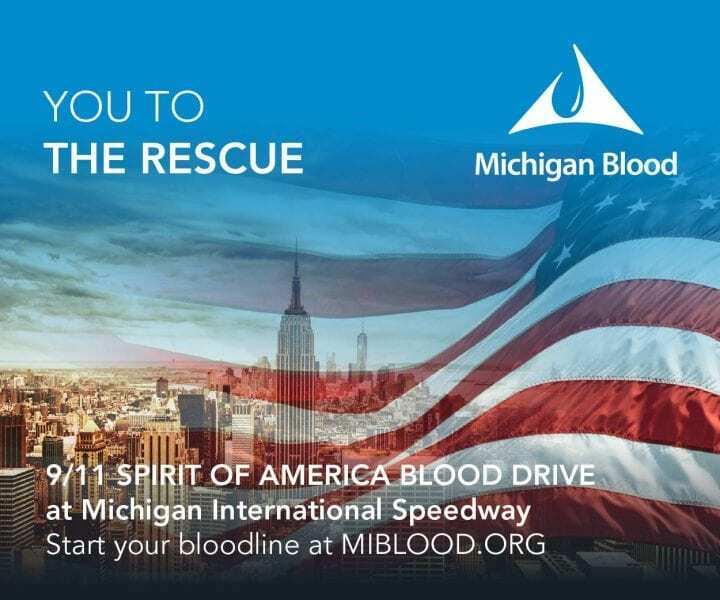 Every year since then the Speedway in the Irish Hills near Brooklyn Mi has given Michigan residents an opportunity to honor those victims and heroes by donating blood. But, it’s not just about giving blood. It’s about the commitment to “never forget” and to pay forward the memory of lives lost by saving lives today. 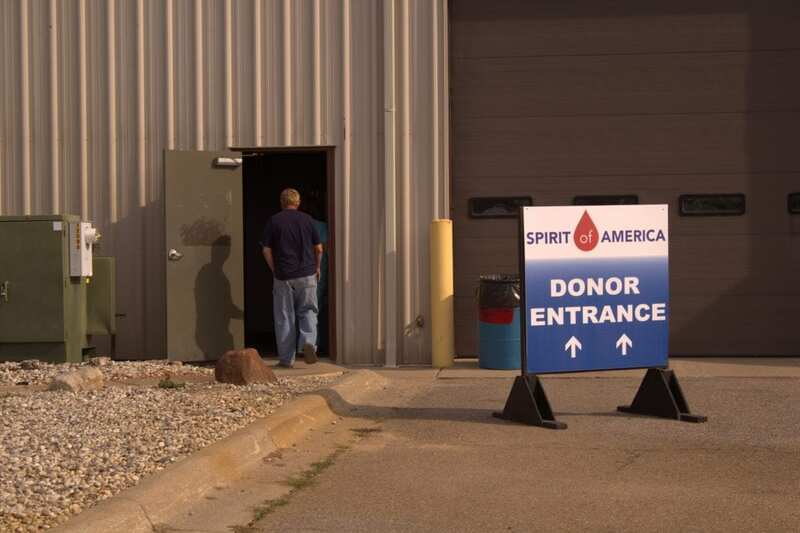 Donations to the Spirit of America Blood Drive stay right here in the State of Michigan. Thanks to the efforts of Michigan Blood, a non-profit organization located in Grand Rapids. Heidi Seitz, Manager of Donor Recruitment for Michigan Blood, says. 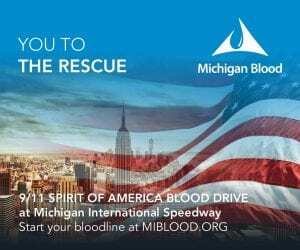 “The Spirit of America Blood Drive is our biggest donor event of the year.” Michigan Blood services the needs of 70 hospitals across Michigan. According to Heidi. 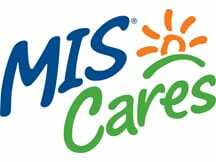 “It takes 560 people every day donating blood to meet the needs of the hospitals we provide blood services for.” Blood drives are held daily in communities statewide with approximately 20 larger events annually, like this one, that are sponsored by organizations such as MIS Cares. Schools in the Irish Hills area provided the opportunity for their students to donate. 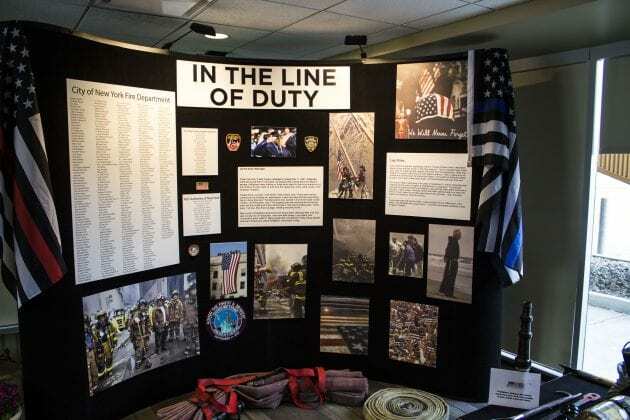 The Jackson Area Career Center had students from their firefighter education and law enforcement programs participate. Jonesville High School and Jonesville Alternative High School also brought students to the Speedway with appointments scheduled during slower hours to keep a steady flow of donors for the Michigan Blood staff to work with. 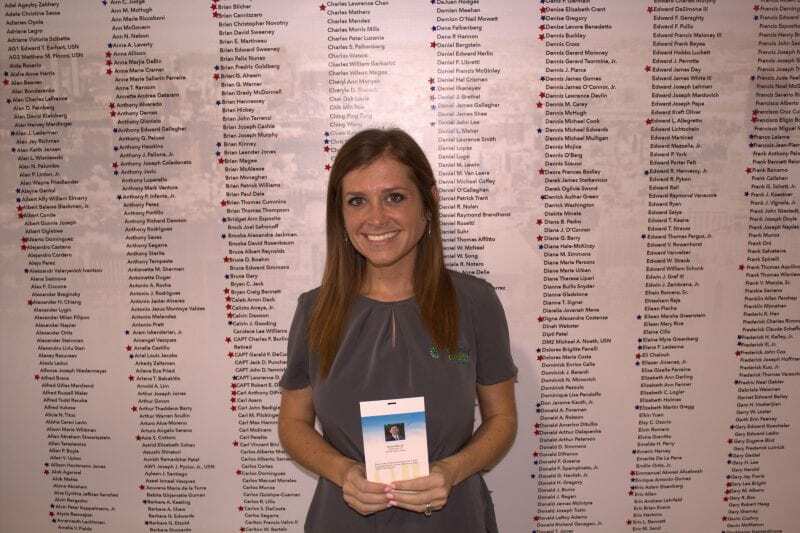 Jennifer Nelson, the Grand Rapids Donor Services Educator for Michigan Blood, makes sure the staff is properly trained and ready to assist those individuals coming to donate. 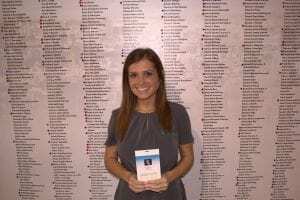 The 2017 Spirit of America Blood Drive booked 835 donor appointments for the 12 hours, 7 am to 7 pm, available for this year’s event. 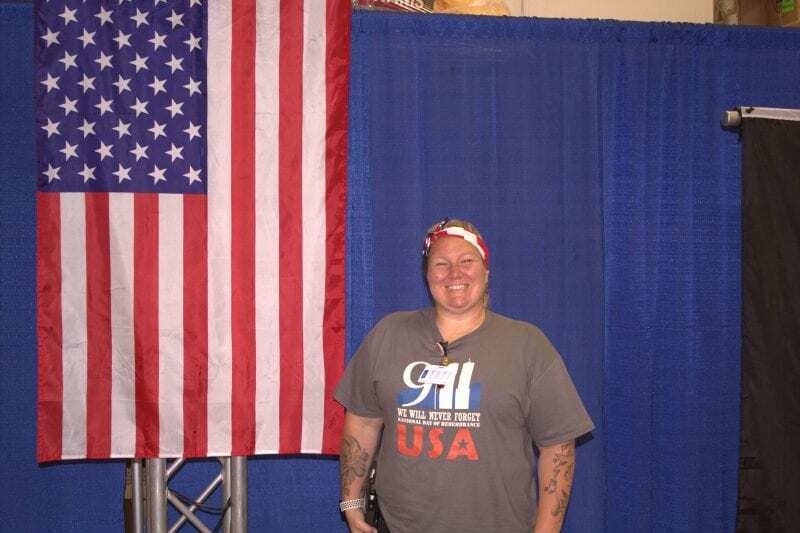 Jennifer served eight years in the Navy. She says her job is the “most rewarding career she can imagine.” She compares the satisfaction she receives similar to how she felt while serving her country. As you enter the Speedway grounds signs direct you to the donation center. The security gate is staffed by volunteers from the Kiwanis Club of Brooklyn. Chris and Bonnie directed me to the building set up to greet donors. Michigan Blood brought a huge crew of people and equipment to handle the expected influx of people coming to MIS. One of the larger building on-site was cleared to provide the space necessary to hold everyone. Upon entering donors were greeted, information forms were filled out and indexed. Each participant received a badge that provided access to a Speedway tour, a stop at the “Home of the Brave” September 11th memorial exhibit in one of the infield suites. 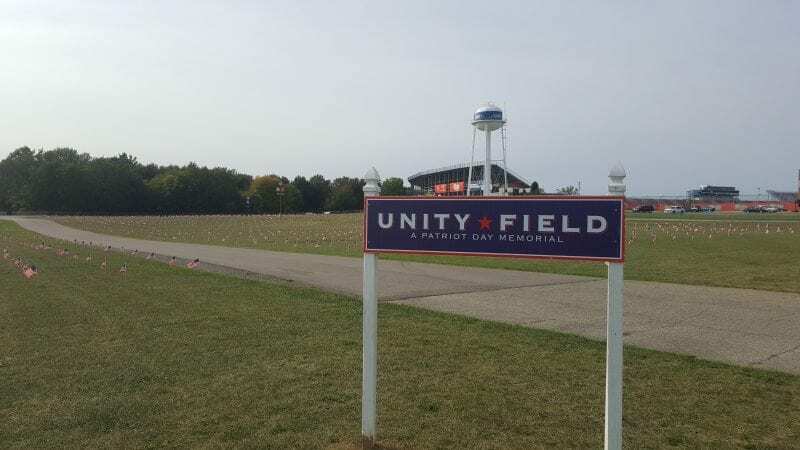 Lunch in the Champion’s Club overlooking the track and a stop at Unity Field with the display of nearly 3,000 American Flags. Each also received a gift pack from the Speedway with a commemorative pin to honor their participation. Michigan Blood’s Donor Services Team Leader from Grand Rapids, Chris Howard, helped donors through the process. Chris explained, “every pint of blood donated is divided into three different blood products. Red cells, platelets, and plasma. 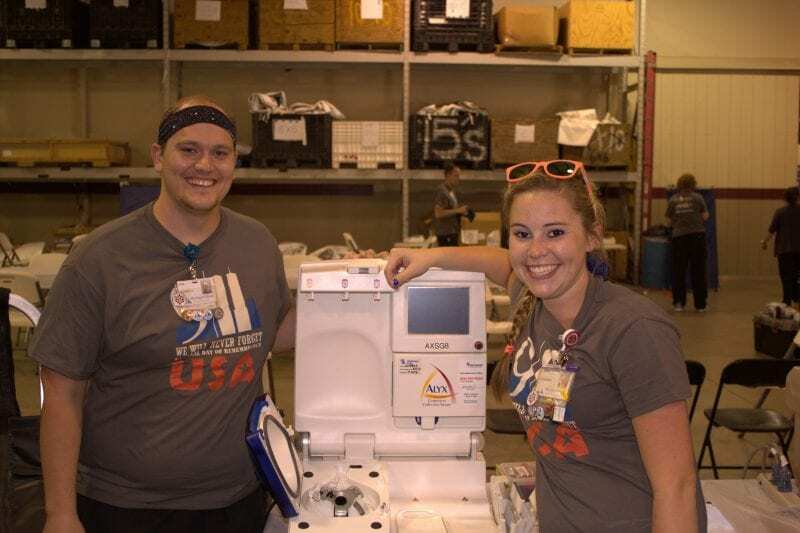 The different products can be used to save three lives from every donation.” Chris also noted that Michigan Blood brought apheresis machines that allow them to remove plasma and then replenish the fluid removed by mixing with saline and reintroducing it back into the donor. The process allows labs to isolate antibodies that can be used to treat autoimmune diseases. 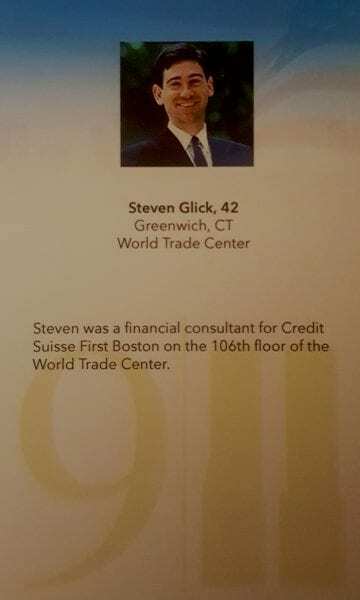 During the registration process, each donor is given a card with the picture of an individual that lost their lives as a result of the terrorist attacks that fateful day. 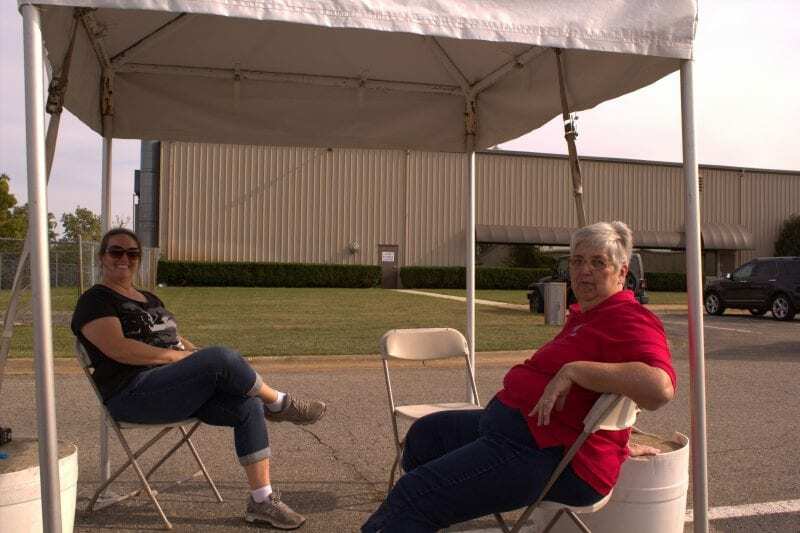 After completing the blood draw process, donors sit in a recovery area where they can hydrate and munch on snacks to make sure they have no after effects from giving blood. 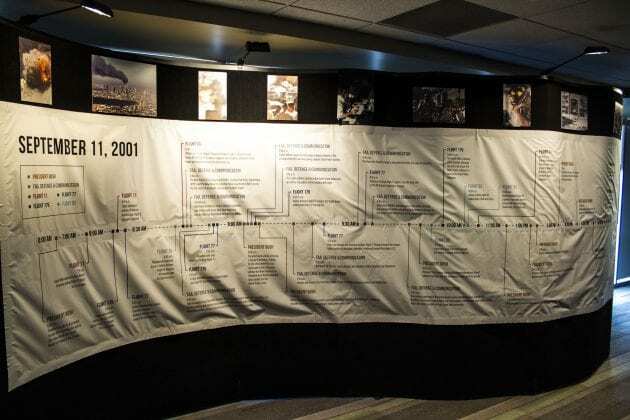 The names of the individual on the cards are displayed on a banner hung from the wall adjacent to the recovery area. As you scan the names on the banner it is a sobering moment. 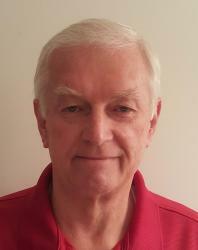 Gary Williams volunteers to drive trams during race weeks on behalf of Gold Wing Road Riders organization. 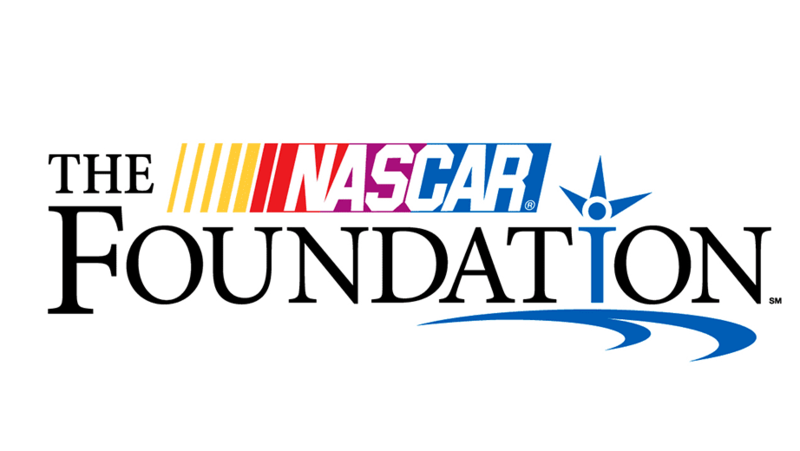 The Speedway donates money to organizations that sign up to provide helpers to fill various jobs during the events at MIS. Gary was searching for a specific name he was assigned on the board. 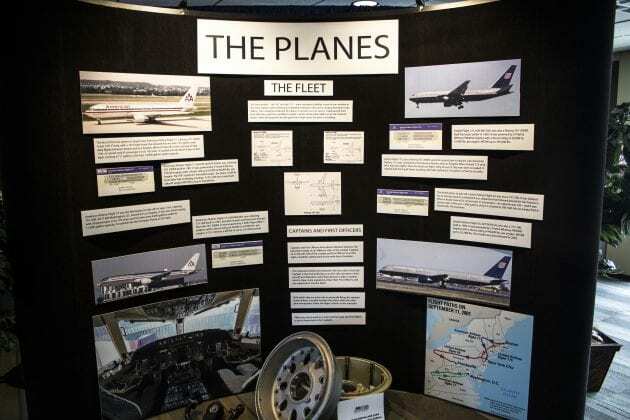 This was Gary’s second year participating. 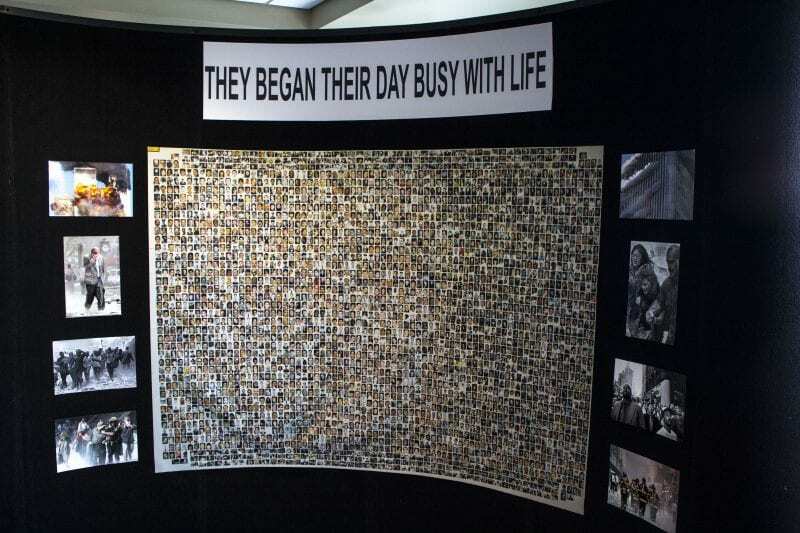 He comes to “donate as a way of remembering these individuals.” Each name, each face represents a life, a family, a story of what occurred on September 11th, 2001. After donating the visit to the “Home of the Brave” 9/11 memorial exhibit is another solemn moment. Here the story of 9/11 is told through displays, exhibits, memorabilia, and a short movie presentation. 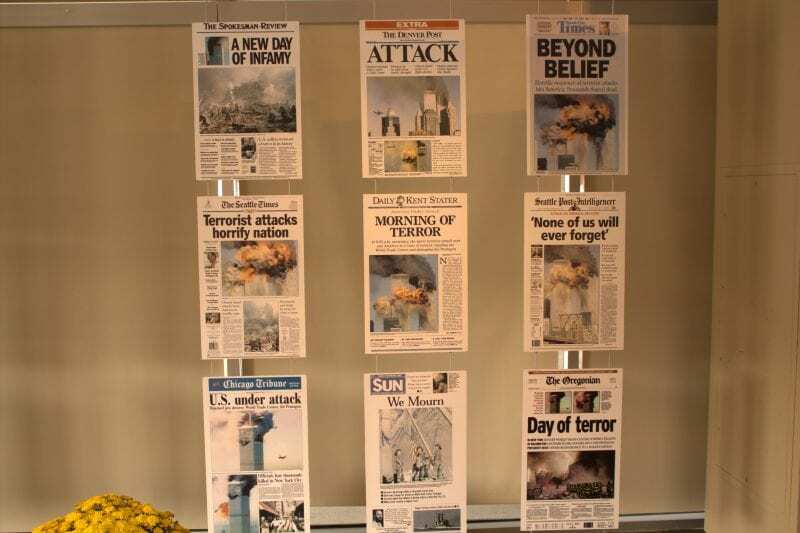 This is where the “never forget” part of the visit and the commemoration of the day is visually presented. 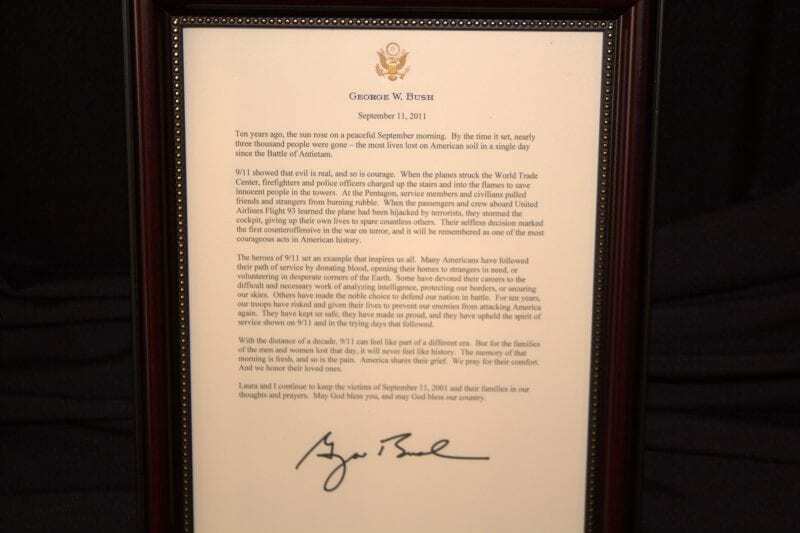 Items for view include letters from U.S. Presidents recognizing the significance of the exhibition, newspaper headlines from the next day, and chronologies of events. 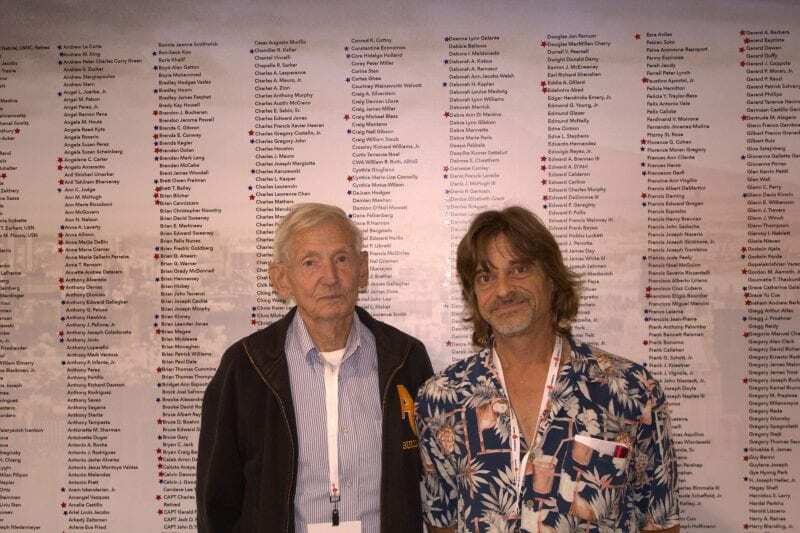 Donald and Jim Emerson have donated every year the Speedway has held the Spirit of America Blood Drive. Donald is 78 years old and plans on returning with Jim next year for the 16th straight time. 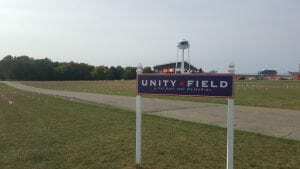 They both commented on the friendly atmosphere created by the MIS and Michigan Blood staff. Jim is self-described die-hard NASCAR fan and never fails to attend events at MIS. Both father and son are members of the 5-gallon club having reached that impressive donation volume level. 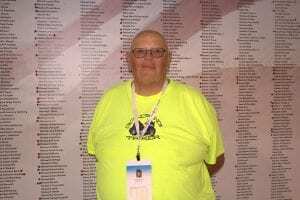 Donald has been donating blood for the past 35 years and given 104 pints over that time period. Simple math says that is 13 gallons in total. If you have not donated blood in the last two months and would like to. You can make an appointment with Michigan Blood. Visit their website miblood.org, click on the Search Donation Locations link, and enter your Zip code to find the closest donation center. For sure, circle September 11th, 2018 on your event calendar and make the drive to the beautiful Irish Hills. 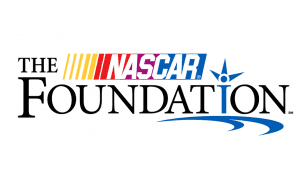 Join with Michigan International Speedway to remember, do your part to “pay it forward”, and save lives in a worthy cause. Follow Steve @steve_tlpress as he reports on the Monster Energy NASCAR Cup Series and contributes feature articles for The Lasco Press.